In a crowded gym full of passionate fans, the “air-ball” chant from the home student section following a big miss by the visiting team, will particularly stand out amongst all of the other noise. That is exactly what Western Albemarle sophomore guard Andrew Shifflett faced in the Warriors’ 48-45 win over Charlottesville Friday night. With his team leading by two early in the fourth quarter, Shifflett earned a rare open jumper from the top of the key and he missed everything. But instead of letting the jeers from the Charlottesville student section deter him, Shifflett attempted the same shot on the next possession, and made good on the ensuing three-point attempt. 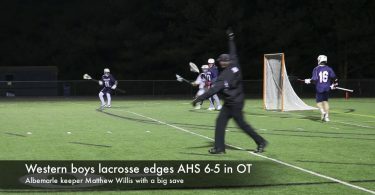 It was that kind of game for Shifflett and the rest of a shorthanded Western Albemarle team. 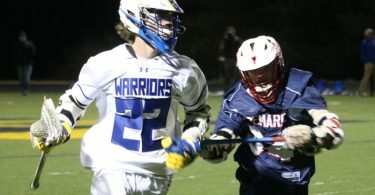 Playing without is leading scorer Tommy Magnum, the Warriors often got knocked down, but got right back up in their third meeting with the rival Black Knights. Behind a game-high 15 points from Shifflett and a balanced effort across the board, Western made big plays on both ends of the floor down the stretch to outlast the Black Knights. Western (10-8) built a three-point lead with 11 seconds remaining before Zy Faulkner’s potential game-tying three-point attempt hit the back of the rim. 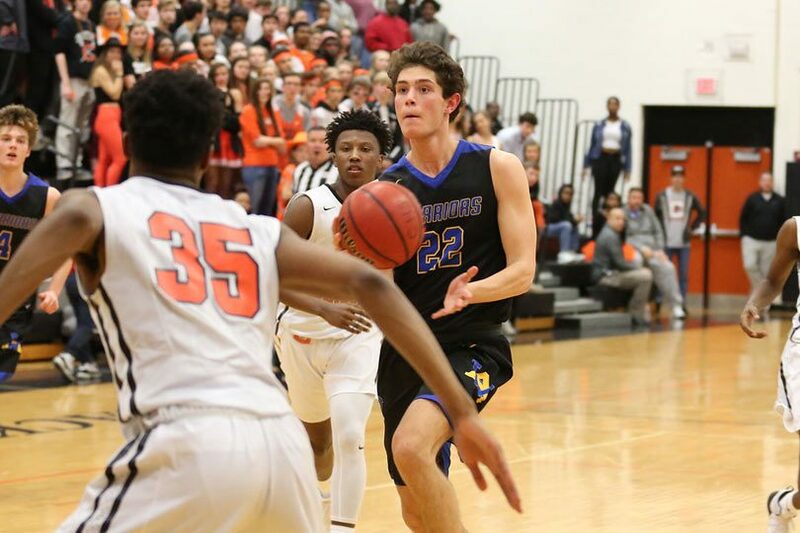 “I’m so impressed and proud of these guys that they could come over here and win without your leading scorer and your leading rebounder,” Western Albemarle head coach Darren Maynard said. The Warriors sorely missed Mangrum’s presence on offense and on the boards, but freshman Henry Sullivan did the yeoman’s work on the glass, collecting a team-best 11 rebounds. Making up for Mangrum’s rebounding prowess was not that big of an issue against a smaller Charlottesville lineup, but to replace his scoring, Maynard entrusted Shifflett and his perimeter players to get things rolling from the outside. Senior Gabe Nafzinger, who missed most of the second quarter with foul trouble, made up for lost time by knocking down a pair of crucial three pointers to help Western Albemarle build its largest lead at the time, five points. After Charlottesville whittled away the deficit to just one less than a minute later, it was junior guard Riley Prichard’s turn to go to work. Fresh off of a season-high 21 points against Louisa on Tuesday, Prichard engineered a quick 6-0 run. The mini-surge featured a key drive and a pair of clutch free throws from Prichard. The junior made arguably Western Albemarle’s biggest rebound of the night with less than a minute remaining as Western looked to polish off the road win. After Sullivan missed his second free throw, Prichard secured the offensive board and quickly pushed the ball out to Nafzinger, who melted 10 seconds off of the clock before getting fouled. Nafzinger then buried two free throws to give Western a five-point lead for good measure. The senior notched 12 big points, while Prichard chipped in seven. As impressive as Shifflett, Nafzinger, and Prichard were on offense, the trio earned their stripes on the defensive end. In a game where each possession counted, the backcourt mates packed in the paint to limit Faulkner and Washington from beating them off of the dribble. The Western defense held both Motley and Faulkner to seven points a piece and just two buckets inside the lane. The Warriors allowed Charlottesville to tally nearly one third of its points in the first eight minutes of play. The Black Knights closed opening frame on an 8-0 run and the Knights built a 15-6 lead early in the second quarter. After surrendering an early bucket by Isaiah Washington, however, Western flipped the script and outscored Charlottesville 10-0 in the final 6:20 of the first half. The Black Knights only briefly retook the lead in the fourth quarter, but hung tough all the way through the end. CHS fell behind by seven points with just over 90 seconds to play, before Damion Washington knocked down a pair of foul shots. Then, Jacob Bowling, who led the Knights with 12 points, connected from long-range to trim the deficit to just two. The offensive rebound and subsequent two free throws by Nafzinger moments later could have been a backbreaker, but Motley quickly cashed in from beyond the arc to pull the Knights to within two. CHS had one last chance with six seconds remaining after Prichard went 1-2 from the line, but Faulkner’s heave at the buzzer bounced out after falling halfway down. The Black Knights will look to bounce back on Tuesday night at Louisa, while Western Albemarle will take on Green Run in the Virginia Preps Classic on Saturday.